In early 2016, Chris and Emilie reached out to me to discuss their recent engagement in Iceland and upcoming wedding plans. 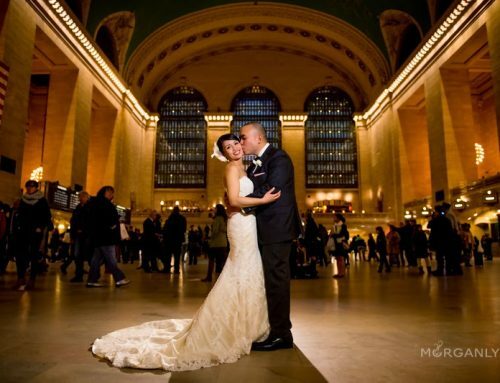 Emilie’s sister was a bridesmaid in a prior wedding that my team and I had planned and based on her recommendation and that of the bride, Emilie and Chris were confident that they wanted Ted Martinez Events to plan their dream wedding. 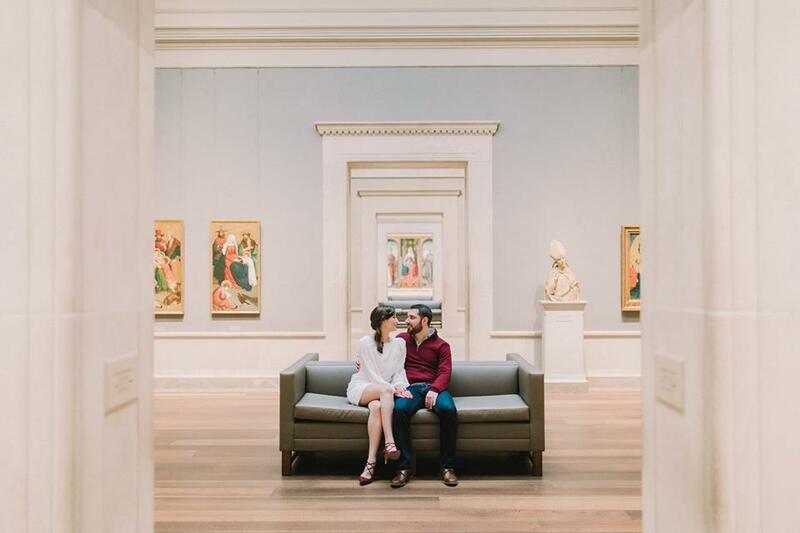 The newly engaged couple knew that they wanted a summer wedding, preferably outdoors, in the Virginia, Washington DC area with a sophisticated yet magical feel. After multiple brainstorming sessions via facetime and phone, I identified a number of well-appointed and serene venues for the couple to visit, and put together detailed spreadsheets setting forth the pertinent facts for each venue: costs, capacity and availability. 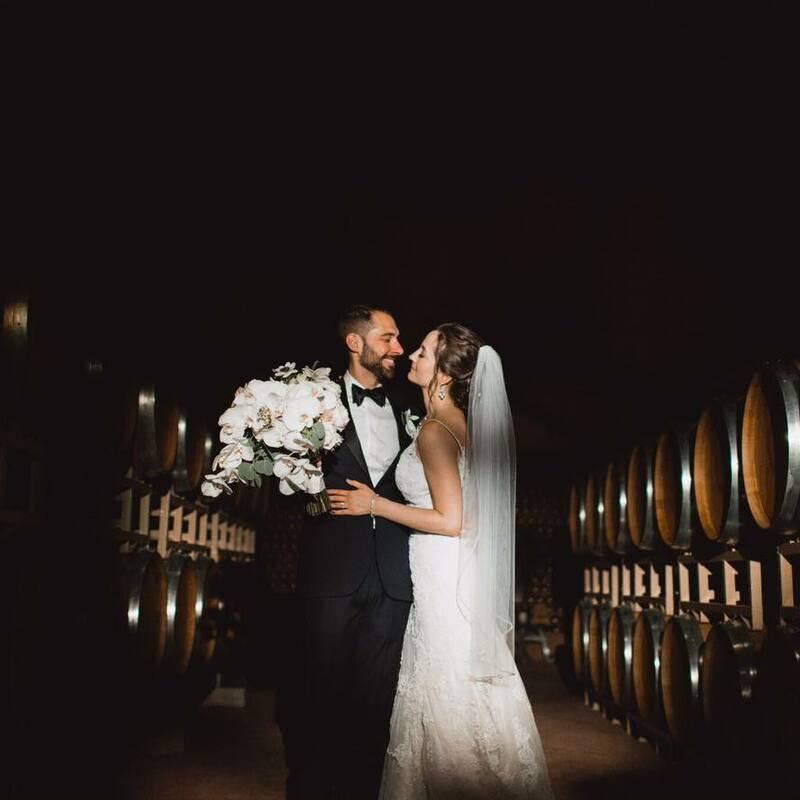 Emilie and Chris ultimately decided on Morais Vineyards and Winery, a beautiful Portuguese-inspired vineyard with an ornate Euro-Classical window-lined ballroom overlooking a vineyard and pond. Rose gold and midnight blue were the palette of the evening, and a natural selection for such an astounding space. 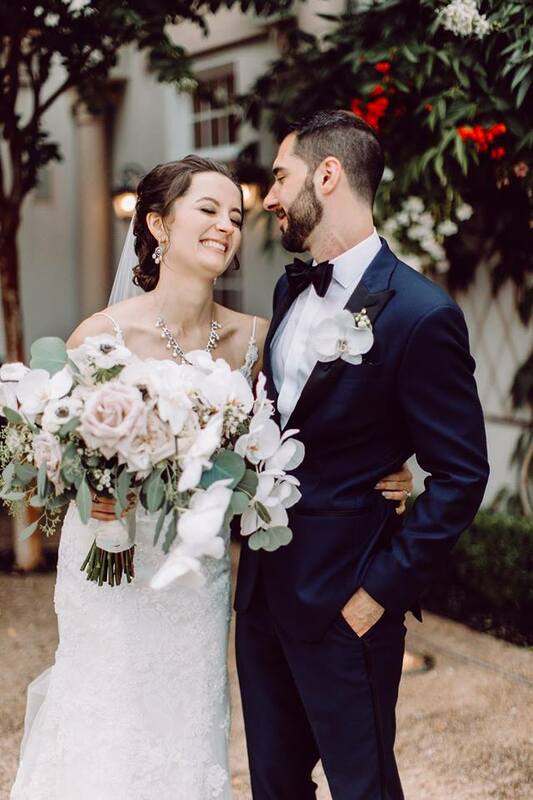 The couple, their families, and 150 guests would stay at Airlie Center, a palatial estate nestled near historic Warrenton where lush gardens abound amidst countless amenities ranging from a rustically chic bar to a Downtown Abby“esque” archery range. 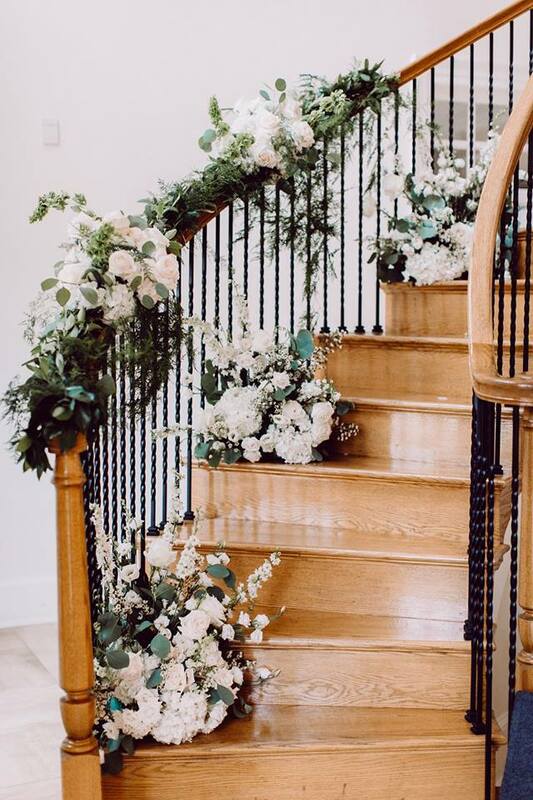 I worked closely with Emilie and Chris to build the wedding budget that was right for them and given the fact that the couple had settled on a July 2017 wedding date, my team and I had ample time and opportunity to hit the market and design the wedding of their dreams at a price that fit their budget. For example, Emilie and Chris wanted the reception tables to be an “experience” for each guest. Emilie and Chris enjoy hiking national parks and they collect vintage advertisements of such parks. They wanted to incorporate this hobby into the table decor in a unique and fun way, so in lieu of a guest sign in book, we decided to adorn each place setting at the reception with a postcard replicating a vintage advertisement for a different national park and invite each guest to write a note to the bride and groom on the back. I found an Etsy based artist in the United Kingdom who sold custom wooden mailboxes. Once the guests wrote their well wishes to Emilie and Chris, the guests deposited their postcards in an old-school European mailbox, painted rose gold and appointed with the couple’s initials. This was just one of the treats awaiting each guest at their table (appropriately named after national parks). I located a gem of a chocolatier in Virginia Beach and right before the wedding, I personally picked up individually wrapped chocolates as selected by Emilie and her mother to fix upon each guest’s place setting. While enjoying their delicacy, the guests could take in the beautiful glow of candlelit tables draped with shimmery rose gold tablecloths and adorned with either towering vases overflowing with svelte florals that cascaded upon each table or majestic “trees” composed of lush branches dripping with glass balls housing tea lights and surrounded by white flowers. Guests were overwhelmed by the beauty of the tables and the centerpieces transformed into conversation pieces. Another example of inspired planning that enjoyed the benefit of time pertains to the welcome bag that awaited each guest upon check-in at Airlie Center, handed to each guest at special welcome table that my team personally manned during check-in hours so as to answer any questions that guests might have. Each bag included, among other delights, custom-packaged Virginia peanuts that I personally picked up from a Planter’s Peanut plant in Suffolk Virginia and chocolate Berger cookies made only in Baltimore, Maryland, which I also personally picked up directly from the cookie plant. The details that marked the planning efforts expended by my team and I did not stop with the wedding reception. For example, I organized a wedding dress shopping day for Emilie, her mother and bridesmaids, which I personally attended together with her subsequent fittings. I arranged for private viewing rooms, brunch at a famous local restaurant in Old Town, Alexandria, and sweets, coffee, and dinner throughout the day. Emilie and her family and friends noted how this wasn’t just a shopping day, but a special experience that allowed them to relax and have fun in each other’s company. Once Emilie said “Yes to the Dress”, we began to work on designing her and Chris’ wedding invitation. I proposed an invitation with front “gates” that would open up to reveal the details of the wedding. The “gates” were a custom laser cut design that matched the lace on Emilie’s wedding dress. An overwhelming number of guests commented on how unique and beautiful the invitation was and loved the sentimentality behind the design. As happens with so many weddings, a few dear friends and family members were unable to attend Emilie and Chris’ wedding, so I arranged for those guests to be able to watch the rehearsal dinner, wedding ceremony and reception by video (in real time!) from the comfort of their homes. My team and I pride ourselves on going above and beyond clients’ expectations and I personally see to it that every detail of every wedding (and every event) is carefully thought out and meticulously arranged. I take great joy in surprising clients with special details from time to time and so when Emilie mentioned to me months before the wedding that she liked Lilies of the Valley, a lesser known variety of flower, because of the symbolism it held for her in connection with her birthday, her mother, her grandmother and her great grandmother, I constructed a delicate yet luxurious display in Emilie’s bridal suite showcasing her wedding dress, veil, jewelry, shoes, and wedding invitation, complete with exquisite cascading flowers and greenery, including Lilies of the Valley—a delightful discovery for the bride. 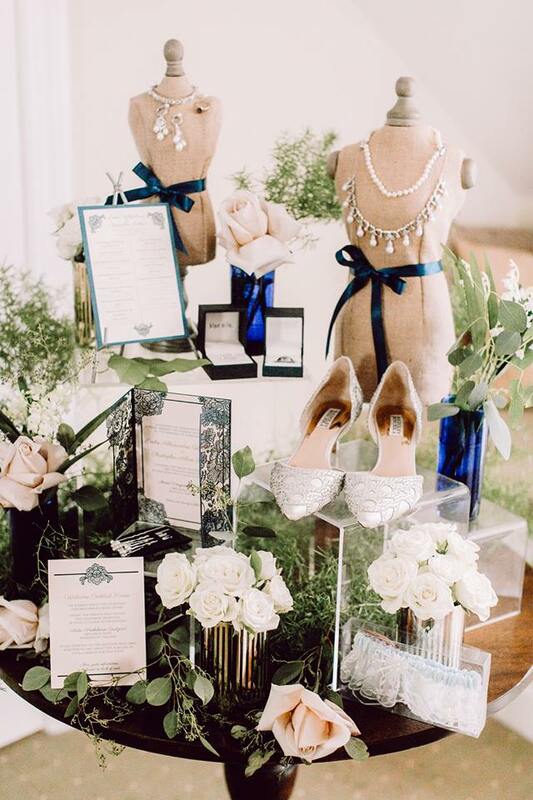 This display awaited Emilie when she checked into her bridal suite. On the wedding day, I arranged another surprise for the bride: while she was getting ready, her bridesmaids came to her suite, covered her eyes and presented her for the first time with her wedding flower bouquet, all of which we captured on film. I take great pride in cultivating the experience of a lifetime for my clients, an all-encompassing experience that delights all of the senses and leaves my clients and their guests saying, “WOW”. Emilie and Chris had the time of their life at their wedding, which they infused with heartfelt details and which I planned with inspired meticulousness. 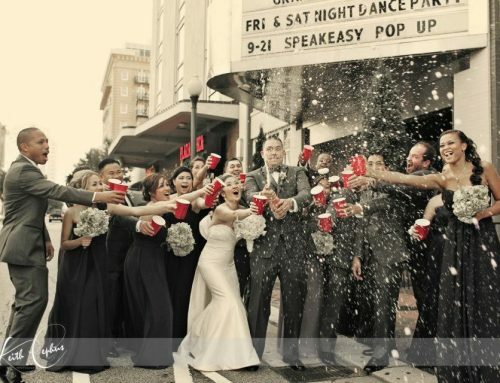 Guests lavished the newlyweds with compliments on the day and the couple themselves said that it was “just an amazingly beautiful day” and that the “excellent planning really showed through”. 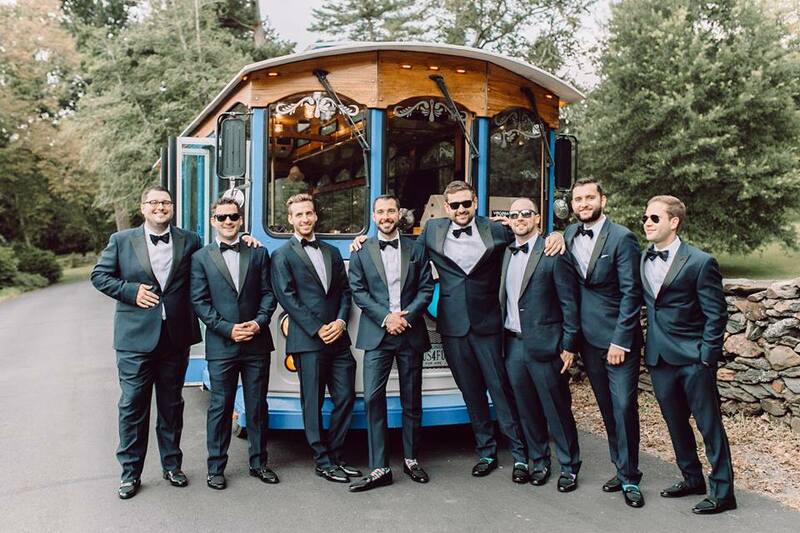 The newlyweds, the wedding party, and their friends and family shared a joyous celebration and throughout that celebration, had the pleasure of seeing not only the great love of the couple, but the nuanced beauty of the wedding and reception as well.